Acoustic based live album from the Tyketto vocalist. Danny Vaughn is certainly no stranger to readers of Fireworks, with an impressive body of work under his belt, including Tyketto, Vaughn and From The Inside amongst others. He is also a regular visitor to the stages of Britain, but it has been a while since he has been able to do any of his popular stripped-down acoustic gigs. So when the opportunity arose to do 2 shows at the tail-end of 2008, it was decided to record one. But instead of the one-man-and-his-guitar type show of old, this time around Danny roped in three-quarters of his solo backing band, namely Tony Marshall on guitar, Steve McKenna on bass and Lee Morris on drums, and adding newcomer Mike Corfield on keyboards. 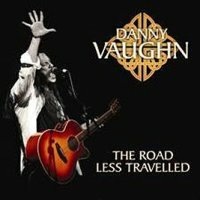 And due to the more laid-back nature of the concerts, Danny took the chance to perform many of the songs from his past that very rarely, or indeed never, get the chance to be heard in a live setting due to the arrangements. So this means no ‘Forever Young’, ‘Wings’ or ‘Standing Alone’, but this is by no means a disappointment! This particular performance was the second night at The Cluny in Newcastle. Opening with the title-track from Danny’s last solo album ‘Traveller’, it’s one of the songs that really suits the acoustic sound, Danny and Tony strumming away to their heart’s content, and although the lyrics are quite melancholy it’s an upbeat number with a singalong chorus, which the Cluny crowd does with gusto. Danny’s voice is a little raspy to begin with, but soon warms up, and the harmonies from messrs Marshall, McKenna and Morris perfect, and it’s a great way to open the show. Although many of the songs chosen are not as well known as the Tyketto numbers, the devoted crowd show that these songs are no less popular, and greet every one like old friends. So from Danny’s solo albums we get the anthemic ‘Restless Blood’, ‘A Million Miles Of Road’, the piano-led ‘Soldiers And Sailors On Riverside’ and the fantastic ‘Lifted’ – certainly one of the best songs DV has ever written. Both From The Inside albums are plundered for ‘Nothing At All’, ‘Making Waves’ and the gorgeous ‘Visions’. However, it’s the slower numbers that are the real stars here, really demonstrating the power and emotion in Danny’s voice. I’ve always thought that the song ‘Damn’ from the first From The Inside CD was the best Danny Vaughn vocal performance ever, and the song loses none of it’s impact by being stripped back. That huge voice is backed solely by Mike Corfield’s gentle piano melody, before the rest of the band join in for the chorus, and demonstrates why Danny should be a megastar. Stunning! The song was originally performed by country singer LeAnn Rimes, and DV reveals that when he decided to record the song he would do it in the same key – hence the fact it hasn’t been performed live until now! ‘Jenny Doesn’t Live Here Anymore’ first appeared on the Flesh And Blood ‘Blues For Daze’ CD, and is one of the songs that only gets an airing in the acoustic setting, and is always well received. Then late on in the set appears the beautiful ‘When You Walk Away’ from the ‘Fearless’ album, never performed live until these acoustic shows. It’s one of the most heartfelt songs ever written by Danny, and his performance here is awe-inspiring. At the show the previous night at JB’s in Dudley Danny was overcome with emotion after performing this song, and was speechless for a few moments with the reaction from the crowd.